Take part in this exclusive and the only one of it's type in South Africa and probably in Africa. Experience a truly unique tour by Bob and Digs who will certainly only be available for these specific tours. Elephant have thrived for 50 million years in the forests and grasslands of Africa. 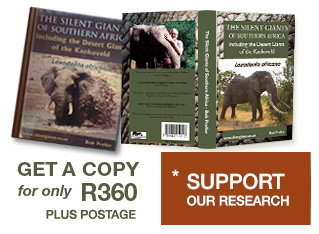 Of the few million elephant in Africa not many decades ago, only about 480,000 still survive. However these iconic creatures could be lost in little more than the next decade or two due to a poaching bloodbath. We can hardly afford to allow a man-made extinction to be the end of this iconic species..
An elephant is being killed approximately every 15 minutes in Africa to supply an insatiable and unsustainable demand for ivory. Inhumane and barbaric methods are used to remove the tusks from the stricken animals, often by chopping the tusks out of the head before its life blood has drained and the animal is completely dead. Sounds terrible, but this is the reality.